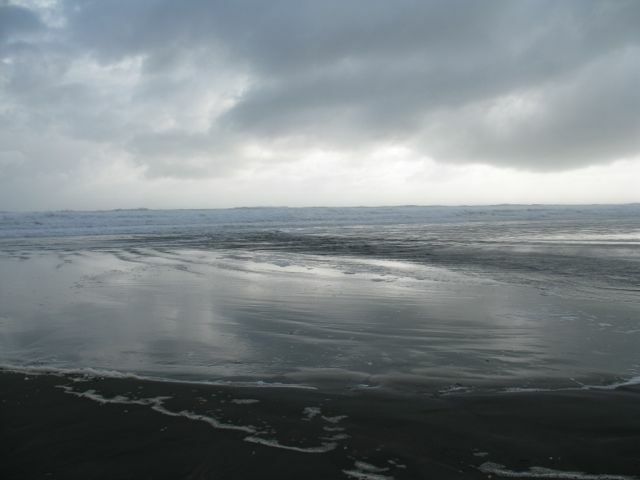 On a wild ironsand beach I prepare to welcome First Light, which in the southern hemisphere falls on August 2 . This festival falls half-way between winter solstice and spring equinox. It was known to my Celtic ancestors as the festival of Imbolc or Brigid. Brigid was the Celtic goddess of fire and her flower was the dandelion, that little yellow sun whose stems are filled with white milk..
And so I make a circle for Brigid, even though the wind is howling, the rain stinging my skin with each new blast, and I need to pull my coat tightly around me to keep out the chill. It’s hard to believe in the returning light after days and days of rain and storm. And so I do what people have done for centuries. I create something to invoke what is missing. I bring in whiteness, the colour associated with Imbolc, which means ‘ewe’s milk’ and marked the return not only of the light, but of life-giving milk. The wind continues to howl, and threatens to blow away my offering or obliterate it with sand. I blow the sand away, gently, from each disappearing shell. The tide rushes towards me. Brigid, in her maiden aspect, became associated with this threshold to spring. She represented the freshness of a maiden, as well as the power of the new moon and the flowing sea. I grow the circle a little more until it becomes a wheel of welcome. My circles are a way of inviting her light, warmth and fire back to our land. Winter has gone on long enough. Brigid, Brigid, won’t you come in? What a warm welcome for Brigid, who will surely come in. I always appreciate how you embrace the seasons, Juliet, and learn each and every time. How interesting it is that Brigid’s flower was the dandelion – considered a weed by most hereabout, I love its cheery color. It is a favorite for children to bring in a bouquet of dandy-lions and we ate the greens, much like spinach, when I was growing up. I did not like them for they were bitter. These days, you can actually buy them in some high-end grocery stores! Penny, I love your conviction that ‘Brigid . . . will surely come in’! Today the rain continues to lash the panes and the wind to howl. The dandelion, with its white juice, was thought to nourish young lambs. In the Scottish highlands, the appearance of ‘the little notched flower of Bride'(another name for Brigid) signalled her return. How interesting that you ate the greens as a child. They are full of nourishment it seems. Thank you. This is very beautiful, Juliet. I think of all the springs, in Vermont where I used to live there was a common knowledge that old people waited until spring to let go, pass away. It was a longing like that for Brigid, the emotional pitch was very high, and it burst forth with such beauteous life, after the long, deeply cold winter. The little circle of white shells and yellow flowers on the windswept sand is enchanting. Virginia, that is so interesting about the old people waiting until spring before they passed away and birthed into that ‘beauteous life’. Vermont would have had dramatic springs, I should imagine. I’m glad you like the shell and flower circle; it was such a pleasure to make it. Thank you. This made me remember that I had a few years ago taken photos of dandelion seed heads on my lawn. This morning, I looked out the windows to see if the dandelions had arrived. It looks as though they have with some stalks have been blown to bits, some stalks emerging with their flower heads, and a couple of others that are opening up in flower. I looked too at what else there was for flowers. Daisy and a lone purple clover flower. How delightful. These days I look at weed flowers quite differently. They do bring some sparkle to my surroundings. Denise, the dandelions have a bit of wind to battle before they show their heads this year. Weeds are certainly being valued once more these days. I like the thought of them bringing in sparkle. Thank you. So simple, so beautiful, so deep. Wonderful! Drawing down the light . . .
Isabella, I’m so glad that this post spoke to you, and I wish you well with calling in new light to your eye. May it heal well, supported by the fresh energy of early spring. Thank you. Hi Hilary, it’s still pretty wintery here. As you go into Lammas we go into Candlemas. I didn’t know that dandelion leaves stopped the sting of nettles. Thanks for dropping in from the other side of the world. This is such a lovely post, and so interesting to read. It’s interesting to know that the common name Brigid is actually a Celtic Goddess. I loved the offering that you have made in the sand for Brigid. Hope Brigid will come to you all soon. Kuttushlambu, thank you so much, and I’m glad you enjoyed the post. Brigid is here today with sunshine and some gentle warmth. In the corner of the world where I find myself, I’m calling on the crisp air and goose cries of autumn…picturing in my mind and heart a ring of feathers and fallen leaves. Dana, thank you so much. I love your image of a ring of feathers & fallen leaves for the coming autumn. It’s great to stretch out our arms across the world and the seasonal polarities. I love your welcome to First Light. No dandelions here yet; just lots of other weeds which know they are safe from destruction in my garden. 🙂 I welcomed light into my house with ‘new’ artwork. Gallivanta, how nice to ‘see’ you here again. New art work is exactly what the Goddess Brigid would call in, since she invokes creative expression. I’m sure the dandelions won’t be long appearing in your safe garden. Thank you. It’s lovely to know that a Goddess heralding spring and new light had a ‘weed’ as her flower. I am a big fan of all weeds and share their nutritional and medicinal abundance with lots of people. 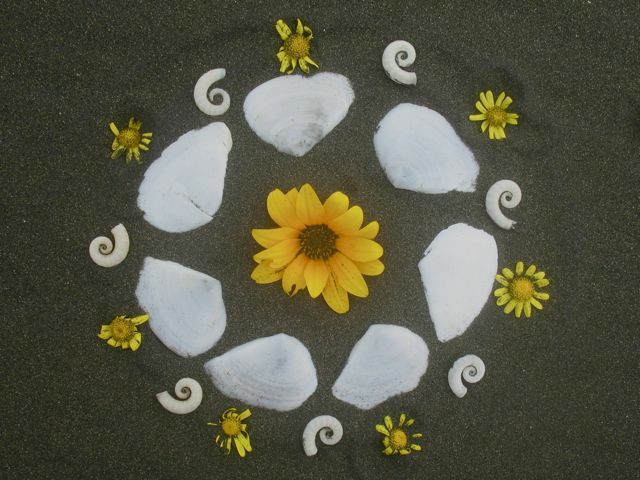 Thank you Juliet for this refreshing and beautiful article with the mandala you made in the sand – it looks like the wild primal Piha beach. Julia, you are so right! It’s wonderful that you do this work sharing the value of weeds with people. 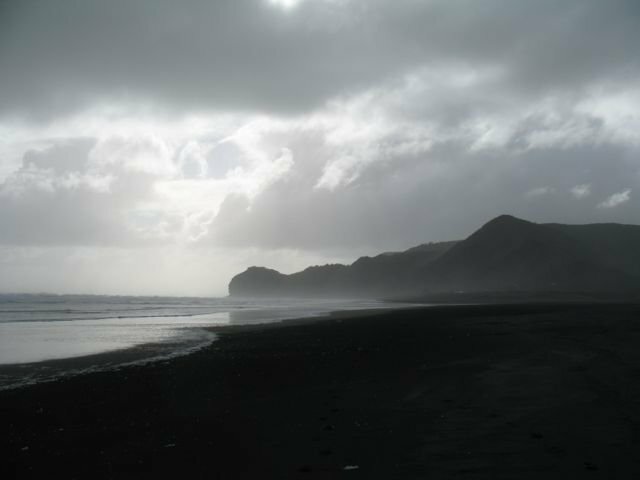 And you spotted the beach right – Piha it is! Thank you.